The Asian region presents a great potential for growth and any major player interested in this space is aware that a significant part of the Asian online gambling industry is based on agent networks. EveryMatrix is pleased to announce that PartnerMatrix, our Affiliate and Agent System, has been enhanced and now can be offered as a stand-alone white label product to any operator or provider targeting the Asian market. Our bespoke approach to this challenge is PartnerMatrix, an affiliate platform with an integrated Agent System that can be offered as a stand-alone solution. PartnerMatrix allows affiliates to operate as agents (transfer money to specific players, place a bet in the system, place a bet on behalf of a player) and at the same time the agents can operate as affiliates (use banners to bring traffic, provide promo-codes to customers, keep sub-affiliates). Most of the operators, running Affiliate and Agent systems together know that it would be better for their agent/affiliate to use one system to track everything, instead of changing the systems to track the same type of data. This is how we decided to bring this innovation to the field. Since it is fully adaptable for different markets and regions, PartnerMatrix is able to respond to all operators’ needs and assist them in creating and maintaining a reliable affiliate program. Built on a flexible commission structure, PartnerMatrix is the first platform that enables operators to run an Affiliate System with Agent functionality and an Agent System with Affiliate functionality. Through PartnerMatrix, operators can offer their affiliates revenue share (based on first time depositing players), CPA or hybrid plans. Additionally, we can create new types of commission plans, with dependencies in the system (deposits, turnover, GGR, NGR and etc..). PartnerMatrix helps operators manage and keep track of their own affiliate programs, while having access to comprehensive real time reports on registration, overall earnings, commissions and promotional materials. The system is created in the most possible flexible way. We don’t provide one fix structure to all operators – we let them choose what they want to include in the system. We give the possibility to add languages and translate the system to any language the operator wants. We allow operators to choose which standard template they want to have for their Affiliate System, or either an operator creates his own unique affiliate interface using our API. We are not a factory of standard affiliate systems, that’s why our operators have the freedom to be unique and operate different affiliate systems. PartnerMatrix can be easily integrated with any provider or any platform. Once the operator creates the necessary connections through APIs, it takes 2 weeks for PartnerMatrix to launch the new Affiliate System. PartnerMatrix is the first platform, which provides a stand-alone Affiliate and Agent System. For this integration we also provide necessary data and documents, for an operator to develop connections with PartnerMatrix through API technology. Back office in PartnerMatrix is highly focused on affiliate manager and administrator comfort. It gives opportunity to reach each angle of the website, manage all the operations. Operators have the freedom to select modified functionalities in any section, they are able to request different roles, pages, reports or data that will be displayed and managed. Back office allows to manage all affiliates’ actions (role, type, status, data, commission plan, balance, branch, etc. ), marketing tools (banners, links, screenshots, sub affiliate links, Odds Feed, news and etc. ), commission plans (default plans, new promotions, negative carry over or not, flat changes, etc. ), generated commission (correction, add bonuses), website content, languages, texts and many other things. Reporting is being displayed in real time: sales, products, media, activity and all other reports. In case of a stand-alone integration, the speed of reports depends on how fast the integrated platform will provide data. Commission mechanism is based on an operators’ needs by choosing the period for commission calculation. PartnerMatrix is able to handle calculation based on any time interval. 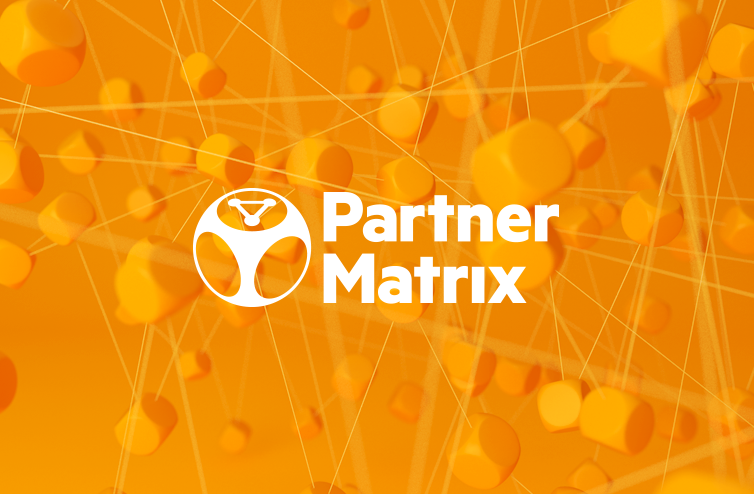 PartnerMatrix is an ever evolving solution that is under constant improvement and we are delighted to present it as the first product in our portfolio to be launched on our latest platform. With the refactoring of our affiliate solution, new operators will be able to implement faster new affiliate programs and management systems. We strongly believe that finding the right balance between high performance and product quality requires team work and common vision. To that end, EveryMatrix has assembled PartnerMatrix project as a separate business unit in EveryMatrix, which contains its dedicated account management, sales managers, development team, management team and of course designers, which means that PartnerMatrix fully concentrates on providing one of the leading partnership solutions in the world. At this moment, EveryMatrix is the first company in the world to provide a complete affiliate marketing and agent management system as a stand-alone solution which allows operators access the Asian market right away. The Asian iGaming industry is recognized for its confidence in the Agent Affiliate System, where most traffic is provided by agents of any level and size. Through PartnerMatrix, EveryMatrix becomes the first company to offer a stand-alone Agent System for iGaming companies by delivering a flexible platform that can be integrated with both operators and providers. Furthermore, PartnerMatrix can be included by other providers into their platform offering alongside their own gaming products. Want to know more? Check our PartnerMatrix web page to discover more details on the EveryMatrix affiliate management system.